I am an ex mining Electrician, and have just found your web site, marvellous resource that it is. I come from a mining family we all lived just North of Barnsley. Just recently I have taken to writing about my walking experiences when I was young, the pits around here were just playgrounds. Mining affected every part of the area, either by money or by the environment. These walks are just my way of setting down the effects that mining had on me and my contemporaries of course. During the writing, I found that I had to research collieries, that is how I came across your site. I try not to go into the historical details, others have already done that, I walk around, photograph what I see, then write up where it came from and what it did in the landscape of the time. This process made me consider carefully items found, I have not removed any, they are still exactly where I found them. It has spurred me on to delve a little further, maybe when I retire I’ll look more deeply into the background. I keep trying to get younger people interested, some aren’t bothered; even my grandkids didn’t know Royston was a mining village. There are no mines here any more, just the remains if you know where to look. To try and keep mining knowledge around and relevant is difficult, we led a separate life to most, in bed when they were up and in the dark for hours at a time, on that note you’d be surprised how very few believe how dark it is when there’s no light. Simple things like that are slowly being lost. I’m sure coal will come to be needed again, but I do worry how many people will have to die to rediscover that technology might change, but the dangers will still be the same. 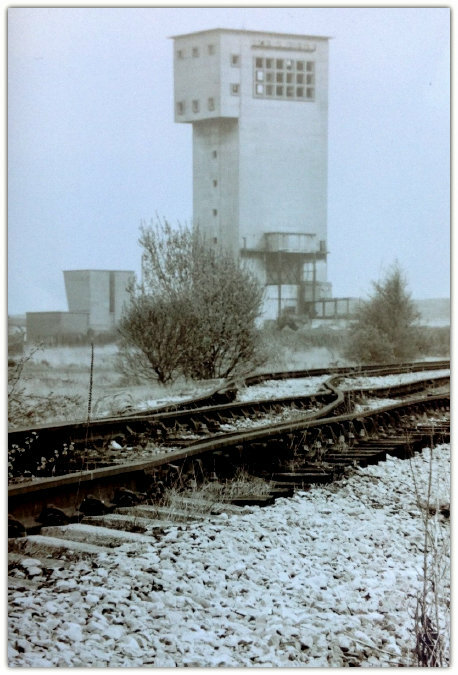 If you are ever on Facebook, seek out Local Stuff for Local Folk, there’s loads of mining and railway related photographs, it’s not my site I just contribute to it. I have a photograph of the Wakefield rescue team from about 1904 I think, I can easily forward that, when I locate it again, might be more your cup of tea. I’m doing a short article about who owned what and the mining accidents that occurred, not an in depth study, possible reasons etc, Mind you whilst doing this I came across a colliery that I had never known about, and that led me to your site and that led me to another colliery in the area that I no knowledge of. I will expand this to show why mines opened in our area, which coal seams are available, and how it was extracted, but all, hopefully, in layman’s terms. Once I’ve written it up and confirmed the dates of the fatalities, I’ll let you have that as well. All the errors, and there will be some, are mine and mine alone. The information can be checked, but differs from source to source. Maps will not be to scale, but should show enough modern references for anyone to be able to locate themselves. I claim no copyright on the images and information within, use it as you please. If you spot an error or have more information please let me know. I found that I couldn't complete this booklet without finding out some detail about Henry Lodge. After all, the pit and tramway are named after him. Henry was a weaver by trade, he seems to have come from Skelmanthorpe, to Ryhill via Barugh. However he got there, he didn't waste a lot of time before he bought a Coal Lease. This was in 1872. Henry had interests in three pits, Ryhill, Ryhill Main and Goldthorpe. Ryhill Main about 320 workers from 1874 to 1918 but was abandoned in 1923 with a remaining workforce of 154. Coal was reached at with a shaft depth of 55yards in March 1874. Goldthorpe was a much larger concern, employing almost 500 workers. By 1933 Goldthorpe belonged to Goldthorpe Mining Ltd, there is no trace of any of the Lodge family being involved in mine ownership. It seems that all the local coal leases were transferred or sold to the Monckton Mining Company. Henry Lodge Managing Director, living in Woodlands, Nostell Lane, Ryhill. W.B.H. Lodge, living in Thornroyd, Station Road. Ryhill. W.C. Haigh living in Crown Cottage, Station Road, Ryhill. The company secretary was Secretary Wm.C. Haigh. The colliery managers in 1896 were, at Ryhill, H. Fisher, at Ryhill Main, J.W. Fisher and at Goldthorpe E.W. Holt. It is easy to see why Ryhill and Ryhill Main could both be called Lodges, Ryhill or Ryhill Main. For the purposes of this booklet, I have chosen to use what I was told by my father, that the smaller colliery, Ryhill Main, was located at one end of the Winds near to Cow Lane at the bottom of Newstead Hill, this was the shallowest colliery and would have provided the quickest return on the money invested. The ventilation fire chimney was still standing when I played down there in the late 1950's and early 1960's. The extent of the spoil heap was evident, but quite small. We never found the shaft entrance. Thinking about it now, we were looking in the wrong place. The main problem for this colliery would have been transportation, Cow Lane did not exist as a tarmacked road until about 1905, there was no railway connection and no canal. All the coal would have been transported by horse and cart. One further small point, during the course of the miners strike of 1926, 100 miners were summoned to Barnsley Magistrates Court and prosecuted for stealing coal from Lodges Pit. There’s no mention of which pit it was. Looking back, it is easy for us to discount transportation links in the development of a village. Our modern day transport is mainly by heavy goods vehicle. They are relatively small, highly manoeuvrable and plentiful. Try to imagine a time when there were no hard road surfaces, baked mud with potholes or soft mud with sink holes; heavy loads either broke the cart or just sank. This would limit the output from any industry to the amount that could be moved at a maximum of about 1 tonne at a time. All goods were delivered in small quantities to warehouses at the side of rivers. Water was the only choice for heavy goods transportation. Engineers solved some of the transport problems by making man made rivers, canals. These were of a known depth and width, with a load limited only by the size of the barge. Coal belongs with these heavy goods, there would be no point opening a mine unless you knew you could transport the coal in sufficient quantities to enable a profit to be made. Royston was ideally placed to benefit from the trade in coal, the Barnsley canal was already established. Its purpose was to enable the movement from the Barnsley coal fields to the East coast shipping ports for onwards transportation. Before local coal mines started, the canal was shipping 100,000 tons each year. What was needed was for men like Henry Lodge to come along and extract coal locally. The first mine that I can trace in this area was Ellis Laithe colliery opening in 1867, then Havercroft Main in 1868. Henry Lodge opened his first mine, Ryhill Main in 1872. Havercroft and Ryhill are ideally placed for easy coal extraction, much more so than Royston. The geology means that the coal seams are much nearer to the surface as you ascend the hill towards Havercroft green. This becomes a double edged sword, being nearer to the surface it has oxidised and is not really good quality. It was cheaper to get started here, so for a quick return on capital, Havercroft and Ryhill were good options. The first seam available is the Shafton Seam, this surfaces in many places, Lundhill, Bushey Wood, Wintersett reservoir, scrat the surface round here and there it will be.